Baroness and Deafheaven have announced plans to team up for a co-headlining tour early next year, marking the former outfit's first continent-wide trek in nearly three years. Joined by Zeal and Ardor, the three-band bill will play a total of 26 dates on the continent next March and April. You can find a complete itinerary below. Five Canadian dates have been included on the run. The bands will make stops in Vancouver, Edmonton and Calgary in the month of March before travelling to Toronto and Montreal to open the month of April. Tickets for all dates go on sale Friday (December 14) at 10 a.m. local time, and can be found through Baroness' official website. Baroness are currently at work on their fifth studio album, which will follow 2015's Purple. 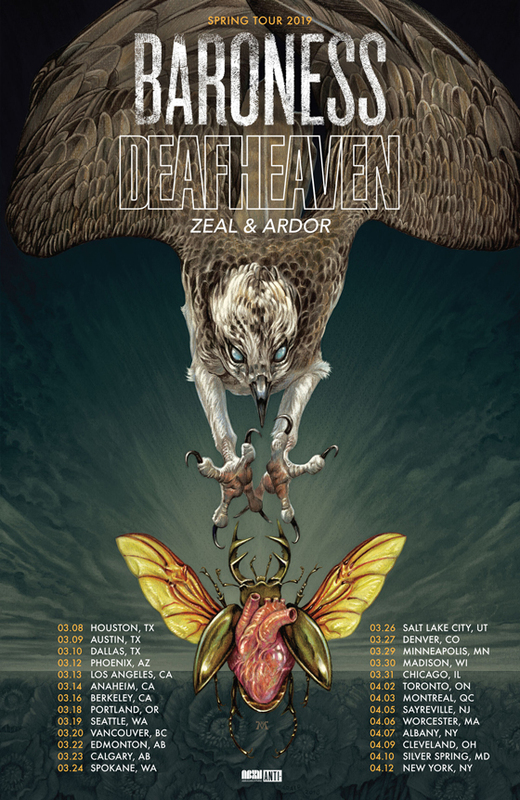 Both Deafheaven and Zeal and Ardor released albums this year, delivering Ordinary Corrupt Human Love and Stranger Fruit, respectively.